This is a perfect nautical design for your home. The cherry wood base has a carving of a wave design. 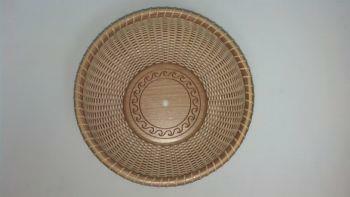 The basket is woven in the traditional cane and reed materials and has a cherry wood rim. The basket is signed and dated by Lisa Bessette. The center is decorated with an ivory plug. This basket come in an 8 or 10 inch round size.